Motorsports in India. Sounds paradoxical, doesn't it? Motorsports have never gone hand in hand with the world's largest democracy. Though India has attained major strides in the IT sector, motorsports is in its nascent stage. However, as motorsports marches into the 21st century envisaging the goal of spreading its tentacles into uncharted territories, India is beginning to lure the entire motor racing fraternity. Motor racing in India was always the prized possession of the elite class. Even today, the common man in India perceives motorsports as an expensive hobby. During the Seventies, when racing generally and Formula One in particular was at its peak, the foundation stone for Indian motorsports were laid. This period witnessed the inauguration of annual race meets conducted on unused air strips in Madras and Bombay, although the machines used were eons behind their international counterparts - both in terms of design and in technological finesse. But racing soon gained enormous popularity, and subsequently the organizers - the Federation of Motor Sports Club of India (FMSCI) - commissioned the country's one and only racing circuit on the outskirts of Madras, with the 3.75 km circuit being opened by none other than triple World Champion, Jackie Stewart. In the Eighties, when the world was witnessing the Prost-Senna duel, Indian motorsports received a major facelift, thanks to the arrival of whiz kid Karivardhan. He was the backbone of Indian motorsports, pioneering the evolution of the modern single seater open wheeled racing car, ala Formula Ford. He, along with another veteran Vicky Chandok, designed and raced these 800cc machines, known as Formula India Single Seater Maruti Engine (FISSME). The crowd thronged to the Madras circuit to witness these locally designed racing cars. However, Indian motorsports came to a standstill when Karivardhan succumbed to his injuries suffered in an air crash, and the interest eventually died down as motorsport was left in the doldrums. In the early Nineties, the name of Narain began to sprout in the local motor racing arena. Nephew of the late Karivardhan, Karthikeyan had racing in his blood. He chose road racing instead of rallying, which remains the most popular form of motorsports in India. Karthikeyan raced in local club races and the FISSME Championship, and quite quickly stood apart from the rest; it was obvious for all to see that he had the right mix of talent and vigour that could spearhead him into the international motor racing arena. This caught the attention of corporate bigwig, Vijay Mallya, owner of the UB group, manufacturers of the premium Kingfisher brands of beer. Incidentally, Mallya - an avid motorsport enthusiast - sponsored the Benetton F1 team in the mid-90s. This drew the attention of the major tyre manufacturer, JK group, who actively involve themselves in Indian motor racing, to sponsor Karthikeyan for his international campaign. Karthikeyan's first destination was South East Asia, and the target was to accomplish the Formula Asia Championship. The Championship, started by Briton David Sonnenscher, is designed to promote motor racing in Asia, and to encourage aspiring Asians to compete in a Championship on par with Formula Ford, while sparing the participants of much of the financial burden. Karthikeyan impressed the Formula Asia crew as he clinched the Championship and became the first Indian to win the Championship. This elevated him to enter the British F3 Championship in 1998, with the much underrated Intersport Team. The team were on a shoestring budget and in troubled waters. Karthikeyan couldn't make inroads in the Championship, and to compound this, he was now drained of funds, returning to India empty handed. However, after much lobbying he received a new lease of corporate sponsorship, joining Carlin Motorsports at the end of the 1998 Championship. In 1999, Karthikeyan clinched his first win, at the notoriously fast Brands Hatch circuit. This Kent venue also gave Karthikeyan his second win later the same year. However, while he was hailed in Britain, the response of the Indian fourth estate to Karthikeyan's accolades were paltry. The reports were few and far between; Karthikeyan never got his share of the limelight. Despite the lack of Indian press, the automobile sector as a whole in India was booming, with major international players stepping into the Indian automobile sector. This included the top two manufacturers in the world - Ford and GM. Ford's foray into India became crucial for Karthikeyan's success. When Ford bought the Stewart outfit, Ford India President, Phil Spender, chose to sponsor Karthikeyan in the 2000 British Formula 3 Championship. This gave the necessary impetus to Karthikeyan as Ford India took the front seat in piloting his success. This facilitated Karthikeyan in acquiring a drive with the Stewart F3 team. Narain also had an option of testing the Jaguar F1 car. 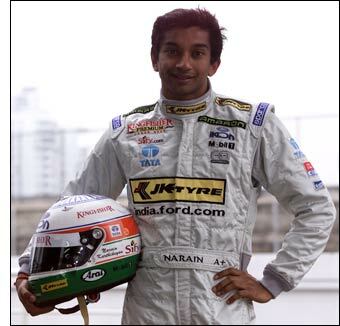 Vying for a test driver status in F1, Narain began his campaign on a high note. Luck, however, had its say, as Karthikeyan's season was all the more mediocre and with a spate of non-podium finishes, the Indian placed fourth in the final standings, two places behind his debutante teammate, Tomas Scheckter. Hence, Karthikeyan lost the golden opportunity of becoming the first Indian test driver in Formula One, which incidentally went to his South African teammate. Karthikeyan's career further nosedived when Stewart opted out of the annual Macau and Korean F3 fair. However, his former team Carlin came to his rescue and Karthikeyan reveled in Macau and Korea. Though he lost in Macau despite taking pole position, he won in Korea and his morale was boosted. Commenting on his entire 2000 campaign, Karthikeyan now says that 'it has been a roller coaster ride', and he attributes his Stewart performance to the disparity in car set-up. He laments that there was ambivalence in terms of cars provided by the team. To compound that, having the 1979 F1 Champion by the side of his teammate doesn't spell success to Karthikeyan. He adds that with his Far-Eastern success, Jaguar has increased the testing schedule from half a day to two days and he is optimistic of becoming the first Indian F1 driver by 2002. At the moment, he is eyeing the Formula Nippon Championship and has tested for the Impul Team. Despite Karthikeyan's headway into Formula racing, the Indian Government is still tightlipped towards motorsports. Luring the first estate's help still remains the achilles heel for Indian motorsports. Though Ford has sponsored Narain Karthikeyan, India is yet to witness a manufactuers' battle. There is no proper 'works' team and the cars used lag on the technology front. However, one heartening fact to have emerged in recent years is the sprouting of go karting tracks all over the country. Go karting seems the latest fad for the average Indian. Though it wasn't taken seriously in the initial stage, 2000 saw the culmination of an annual National Go Karting Championship uner the auspices of JK Tyres. Again, there are several barricades which the Indian motorsports fraternity has to face. The greatest challenge is to educate the fans about the various echelons of motor racing before reaching the pinnacle of motorsports, and the corporates should work in unison to promote motorsports as a whole. In fact, going by the rising patronage F1 enjoys in India and the big bucks involved in it, the West Bengal Government (a state in India), in partnership with a group of non-resident Indians formed an organisation called Grand Prix India Inc. Their aim was to bring F1 to India by 2002 in Calcutta. However, when they came to know about the gargantuan amounts involved in commissioning the F1 project, the plan was shelved. Motorsports has to develop in phases and the initial plan would be to revamp the bumpy Madras circuit. Formula One may be developing in the previously untapped Asian market, but to convince the Government, and to host a F1 race in the first decade will be an uphill task.